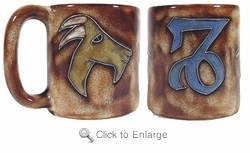 Mara Stoneware Zodiac - Astrology Coffee Mug - Capricorn is the cardinal / earth sign. They are natural goal setters. They willingly handle many tasks when it helps them get what they want.